Monica Miller's 25-foot heave as time expired allowed Lausanne to escape, 59-56, and overshadowed a brilliant all-around performance by Houston's Sarah Watkins, an Arkansas signee, who finished with 39 points. Click here for complete Commercial Appeal article. The game seemed evenly matched at the start but swayed towards Central during the second quarter. Bartlett only had 1 weapon, Jasmine James in the first quarter. Jasmine had the first 11 points of the game and Bartlett as a team finished the first quarter with 12. Central took care of business on the offensive boards and went deep in the bench during the first half. There was a balanced attack with Jamila Ajanaku cleaning up the boards, Jasmine Taylor dropping 3s and Erica Burgess running the show at point. As more players got involved, Bartlett cut the lead down to 2 but their head coach got a technical foul and Central went back up by 4. During the 3rd quarter, Bartlett cut the lead to 4 behind two quick layups and a steal by Jasmine James and to 3 points after a 3 pointer by Jemil Jefferson. Then Bartlett took the lead with 6 quick points from Jasmine James including an inbound trick throwing the ball off the back of the defender. The fourth quarter was full of turnovers, fouls and tiredness. Very sloppy. Only 3 points were scored during the first 3 minutes of the quarter. Central eventually cut the lead to 1 from a 3 pointer by Danielle Ballard and immediately took the lead with a 3 from Jasmine Taylor. The game was tied 59-59 with 1 minute left in the game. Jamila Ajanaku scored 2 points and Erica Burgess stole the inbounds to seal the game for Central. Millington and West Memphis (AR) was a great matchup of athleticism and skill at every position. Jasmine Newsome was the spark hitting 3s, distributing the ball, floating in the lane and stealing the ball. Millington won 53-37. Treadwell’s first points of the game were a 3 pointer and the dominating continued from there. Westwod came into the second half with a 3 pointer clinic of their own to cut down the lead, but it was not enough. BTW put the full court pressure on Oakhaven at the start of the game. But Oakhaven responded to the defensive heat and keep it close. In the end, BTW was too much. Very sloppy game, no one seemed to be able to score. Halftime score was 8 to 7. Same sloppy play during the second half. Hillcrest widen the gap to victory. Pretty even during the 1st half. Northside blew it open in the second. Melrose came out with intensity and lead by 10 at halftime. Mitchell couldn’t handle the defensive heat. Booker T. Washington got a 2 for 1 opportunity tonight. Fairley was all over the place in their vibrant orange uniforms. It was a close game but Fairley took over in the second half. Ugly game. A lot of turnovers and fouls. The home team came out hyped up and full of energy. Hamilton’s Victoria White scored the 1st points of the game with a layup. LaJoyce Clark pulled down rebounds. Khadijah Muhammad took the ball to the rack. And Shervonte’ Bright stole balls left and right. It was all Hamilton.--Love Hamilton, Absolutely!!! The Commercial Appeal reports on Ridgeway's Ashley Tate's comeback from injury. Craigmont controlled the game with a balanced attack. This wasn't much of a contest. Trezevant dominated from tip off. Jasmine "Tootie" Robinson and crew were just too much. Shae Nelson did not dress out. Frayser scored the first basket of the game and keep it close throughout. The two smallest people on the court decided it should be a boxing match instead of a basketball game and had to be separated from each other. Cordova pulled it out at the end. The best matchup of the evening. Central's presence was felt as soon as they walked into the gym in all black and in single file line fashion with matching green and black bags. But White Station was not effected by Central's swagger. White Station led the majority of the first half. However, Jamila Ajanaku was not going.. She lead the team to a come back victory. Adrienne Pratcher and Candace Clear dazzled the fans with cross overs, three point shooting and quickness. Ridgeway put the pressure on Sheffield and never let up.. According to the Commerical Appeal, here are the top scorers for November 18, 2008 games. Former Oakhaven standout, Mary Jackson is a freshman guard for Louisville. This weeks women's college basketball rankings were released and Louisville is ranked 9th in the AP Top 25 and 10th in the ESPN/USATODAY Top 25. Also, Bartlett's Jasmine James and East's Adrienne Pratcher signed letter's of intent this past week to schools ranked in the Top 25. Georgia is 23rd and Texas A&M is 12th & 7th. For the complete rankings click here. Memphis Girls Basketball Season is Here!! 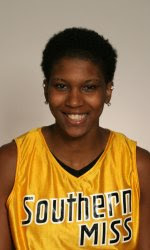 Candace Rucker scored 16 points off the bench in her debut for Southern Mississippi. Hamilton High's Victoria White, Khadijah Muhammad, and Shervonte' Bright at University of Memphis Fieldhouse after Unversity of Memphis Lady Tiger victory against Northern Arizona. While several players had their National Letter of Intent early signing ceremonies on November 12th, Bartlett's Jasmine James took care of business on the 13th. 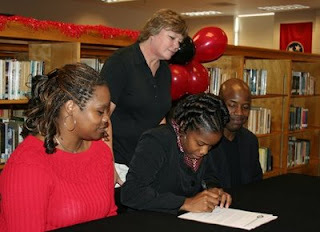 She officially signed her papers to play at the University of Georgia. Read the Commercial Appeal story here. According to gotigersgo.com, Jessica played for two years at Craigmont High School in Memphis after playing basketball at Ridgeway High School her freshman and sophomore seasons...Was a 2005 Associated Press Tennessee All-State first team member and was rated No. 38 in Blue Star's listing of the Top 100 seniors in 2004-05...Was a three-time TSSAA All-Tournament team award winner and was a member of the winning team in the 2005 Adidas Senior All-Star game...A USA Today honorable mention player in 2003 and 2004, she also earned kudos from Street & Smith in 2002 and 2003...Jackson set a school single season record for blocked shots in three different seasons (2002, 2004, 2005) and helped the Lady Chiefs to a 34-4 record and the TSSAA Class AAA state championship game as a junior...Also played AAU basketball with fellow Craigmont product, LaToya Bullard playing for the Memphis Showboats, a team coached by David Bullard that captured the 2002 Adidas 17-and-under title at the Deep South Classic...Also played volleyball at Ridgeway, helping the team to the 2001and 2002 regional and district titles. 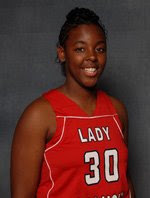 Bartlett's Jasmine James and East's Adrienne Pratcher helped make the Georgia Lady Bulldogs and Texas A&M Aggies rank in the Top 10 recruiting class for 2009, according to ESPN Hoopgurlz. The early basketball signing period begins November 12, 2008 and ends November 19, 2008. Several area high schools are scheduled to host signing events for their seniors. Central will be hosting a National Signing Day Ceremony on November 12, 2008 at 1:00 pm in the gymnasiumon. Senior point guard, Erica Burgess, will be signing with the Lady Lions of Southeastern Louisana. Senior guard, Jasmine Taylor, will be signing with the Lady Red Wolves of Arkansas State University. And last, but not least, senior guard/forward, Jamila Ajanaku, will be signing a National Letter of Intent to play for the Lady Blue Raiders of Middle Tennessee State University. Ridgeway is also scheduled to host a ceremony for Tennessee State University bound Ashley Tate. 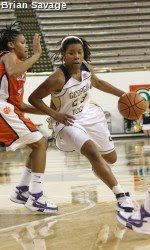 According to Georgia Tech web site, Deja lettered two seasons in women's basketball under coach Julia Stewart at Wooddale High School ... Two-year captain of her team ... All-District Player of the Year during her senior season ... Member of All-District team for both her junior and senior seasons ... Helped freshman team to an undefeated season and the city championship ... Played one season of volleyball and was team captain ... Honor Student.